If you choose to satisfy your hunger with grapes, apples, or spicy meals like curries, then guess what? You could be starving potential prostate cancer cells at the same time. 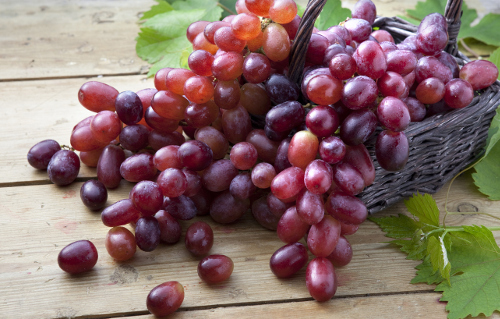 A new study is showing that compounds in red grapes, apple skin, and turmeric may be able to prevent or treat prostate cancer cells by choking their access to energy and essentially starving them to death. This is great news not just for you, but also the health community in general. According to the American Cancer Society, prostate cancer is the second most common cancer among men in the United States. They estimate that there will be roughly 161,360 new cases diagnosed this year, claiming nearly 27,000 lives. And although various lifestyle and dietary factors have shown to play a role in the development of prostate cancer, nailing down a few specifics in prevention can go a long way. Red grapes, apple peels, and turmeric all have active compounds that could block tumor growth in the prostate by essentially cutting off the supply of glutamine, an amino acid that prostate cancer cells need to grow. The central player in cutting off the energy supply to prostate cancer cells, according to the study published in Precision Oncology, appeared to be ursolic acid. But when combined with either curcumin or resveratrol, it worked even better. Now, of course, apples and grapes may go together in a fresh fruit salad, but a sprinkle of turmeric on top? No thank you! Although antioxidant and fiber-rich fruit like red grapes and apples are both healthy and tasty, it’s unlikely you’d be able to eat enough of them to reach the dosages of ursolic acid and resveratrol used in the study. Therefore, supplementing these three compounds make it easier on your stomach—and taste buds. You should note that this is still an early-stage study, and human trials are needed. But with the already well-known benefits of these compounds, it’s likely they could be central dietary measures in the fight against prostate cancer. So, try including more red grapes, apples, and turmeric in your diet, and talk to your doctor about possible supplementation. “Key Statistics for Prostate Cancer,” American Cancer Society, January 5, 2017; https://www.cancer.org/cancer/prostate-cancer/about/key-statistics.html, last accessed June 21, 2017. Lodi, A. et al., “Combinatorial treatment with natural compounds in prostate cancer inhibits prostate tumor growth and leads to key modulations of cancer cell metabolism,” npj Precision Oncology, June 5, 2017; Article number: 18 (2017). doi:10.1038/s41698-017-0024-z. Whiteman, H., “Turmeric, red grape, and apple compounds ‘starve’ prostate cancer cells,” Medical News Today, June 19, 2017; http://www.medicalnewstoday.com/articles/317977.php, last accessed June 21, 2017.